WikiLeaks founder Julian Assange has been critical of U.S. officials. Washington (CNN) -- The Defense Department has demanded WikiLeaks return all documents belonging to the Pentagon and delete any records of the documents, department spokesman Geoff Morrell said Thursday. WikiLeaks founder Julian Assange has said his Web site has an additional 15,000 documents that it wants to publish but is redacting information that could endanger people named. Through the New York Times, the organization has asked the Obama administration for its guidance on what to redact. A recently published report suggested the site has asked the Pentagon directly as well. Morrell, however, denied that claim. "If doing the right thing is not good enough for them, then we will figure out what other alternatives we have to compel them to do the right thing," he said. "These documents belong to the United States government. They don't belong to WikiLeaks. They don't belong to anyone else." The demand, Pentagon officials tell CNN, is an extra effort to prevent the publication of the 15,000 documents. Morrell said Pentagon officials do not know for sure which documents are included in the extra batch, although they say they have "some idea." Morrell didn't seem convinced that the Pentagon's request of WikiLeaks will be taken seriously. "I don't know that we're very confident they'll have a change of heart," he said. "They've shown no indication thus far that they appreciate the gravity, the seriousness of the situation they have caused, the lives they have endangered, the operations they have potentially undermined, the innocent people who have potentially been put in harm's way as a result." Legal experts say the administration has few legal options to stop the publication of the leaked documents, except to go after those who took the documents initially. "The FBI, the (Justice Department) are also investigating this," Morrell said. They "will obviously have to make judgments about how to proceed. CNN was unable to reach WikiLeaks officials for a response to Morrell's remarks. The Pentagon is continuing to assess the already-published documents for sensitive material. A team of more than 80 personel, mostly intelligence analysts from various branches of the Defense Department, in addition to the FBI, are involved in the round-the-clock review. Morrell said the team could grow to as many as 120 personnel. The team has searched using some 400 key words, isolating documents that are concerning, for further review. Items of concern are then followed up on. "As we find things that are of concern, we are notifying appropriate entities -- (including) foreign governments, when they come up," Morrell explained. "If there are Afghan citizens who are named, we are informing the command in Kabul, (which) is then sharing the information with the appropriate subordinate commands and units so that they can take appropriate action to safeguard those people"
There are also counterintelligence officials assessing whether changes in tactics need to be made because tactics, techniques and procedures have been exposed, he added. Once they have finished the keyword searches, the team will then begin a "painstaking" review of each of the 70,000-plus documents published by WikiLeaks. 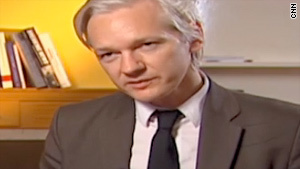 Adm. Mike Mullen, chairman of the U.S. Joint Chiefs of Staff, blasted Assange last week, declaring that Assange and the individual responsible for the leak "might already have on their hands the blood of some young soldier or that of an Afghan family." Defense Secretary Robert Gates warned that the massive leak will have a significant impact on troops and allies. Assange, in turn, said Gates "has overseen the killings of thousands of children and adults" in Afghanistan and Iraq. Pfc. Bradley Manning, who served as an intelligence analyst in Iraq, is the military's focus in the investigation into the leak. Manning, 22, was charged in June with eight violations of the U.S. Criminal Code and was recently transferred from Kuwait to a Marine Corps brig in Quantico, Virginia. He will remain in confinement as the Army continues the investigation to determine whether he should face the military equivalent of a trial over the charges, according to an Army statement. Assange has refused to say where WikiLeaks got the documents.